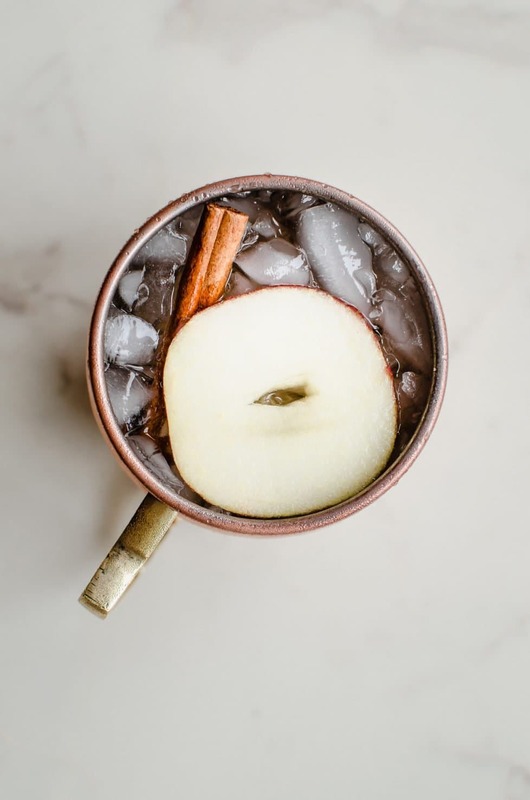 Let’s get our sipping on with an ice cold, gorgeously-hued Applepom Fizz sparkling cider mocktail – the perfect drink for when you want fall flavor when it’s still hot outside! I seriously had the BEST time making this drink. It was hot and muggy outside after a day full of rain, and Ryan was outside finishing up a smoked salmon for our dinner. We both needed something cool and refreshing to give us that last little push to get through the day’s tasks, and this Applepom Fizz really hit the spot! 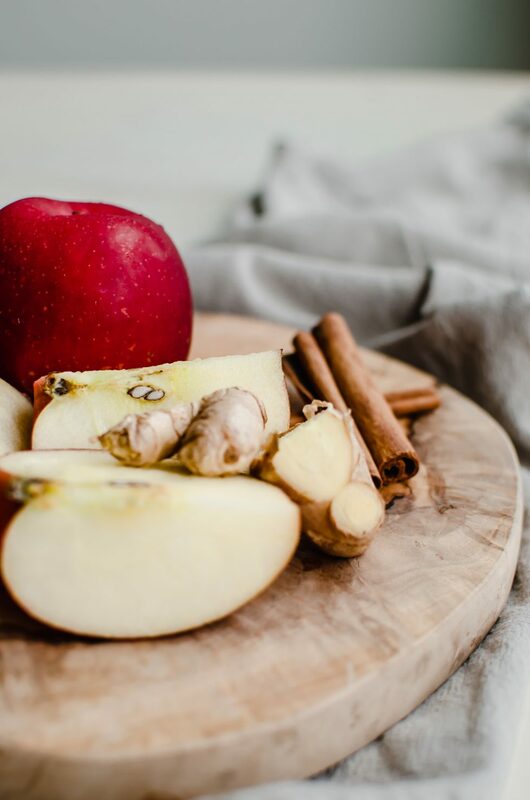 This Applepom Fizz is really an easy, sparkling apple cider mocktail recipe with only a few ingredients that can be made ahead. You can just assemble the drinks individually as needed, or swirl them all together in a big punch bowl with colored ice cubes made from apple juice that have cranberries and pomegranate seeds frozen inside. That would be so cute! What makes this drink special is the super-reduced pomegranate syrup. 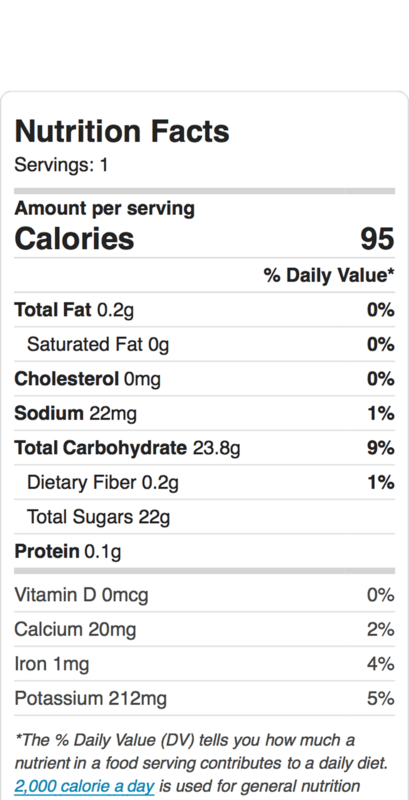 Basically, we cook down an 8-oz bottle of pomegranate juice down to about 1/3 of a cup. 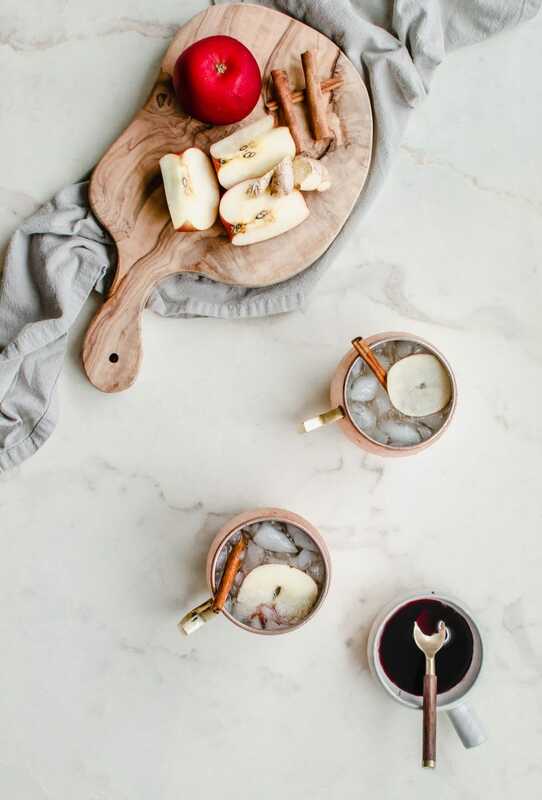 While it simmers and reduces, aromatic slices of fresh ginger and a cinnamon stick flavor the juice and fill your kitchen with the most amazing fragrance! Once the juice is reduced, a bit of maple syrup gets swirled in to add a hint of dark, moody depth of flavor. But not too much! The goal here is to let the crisp, clean and bright flavor of the sparkling cider shine through. In my opinion, the perfect vessels to serve an Applepom Fizz in is a Moscow Mule mug. The copper color screams fall, and the trendy design adds so much charm to your table! 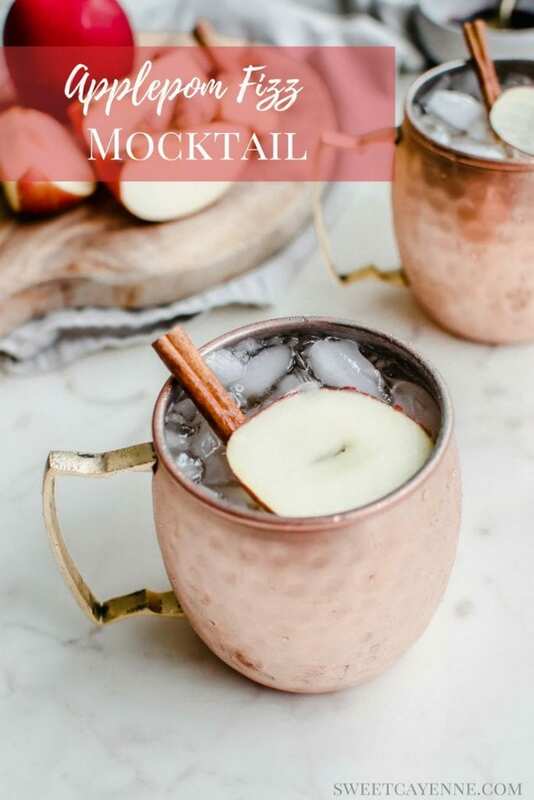 A little while back, an artisan company called Moscow Muled reached out to me to ask if I’d be willing to try their copper mugs and see what I thought. I’ve always loved the look of this type of mug but never bought any because of the typically high price tag. I was thrilled to learn that the Moscow Muled mugs were surprisingly very affordable ($12.50 each), despite the fact that they are handcrafted by artisans and made from high-grade, food-safe 100% copper! The insides are lined with nickel to prevent the copper from reacting to acids and leaching into the beverage. The mugs also keep your drink cold for longer. I can attest to this – I have been filling my mugs with crushed ice and love that it stays frozen for over an hour! This drink screams fall and begs to be enjoyed outdoors, so I can see it pairing really well with anything you’d serve at a cookout, barbecue, or tailgate party. It would be delicious with a cheese board, with Bacon Wrapped Dates, served alongside pulled pork with Cabbage and Apple Slaw, or with a Rustic Sausage and Red Grape Pizza! If you’d like to serve it with burgers, I would highly suggest trying these Blackberry Basil Sliders, which are topped with sliced green apple! If you’d like to make this a cocktail recipe, I’d suggest subbing in a hard cider for the sparkling cider, or keeping the recipe the same and adding in an ounce of Calvados (apple brandy) or bourbon. Are you ready to get make this refreshing Applepom Fizz? Good! I’m so excited for you to try this recipe. Once you get the chance to make it, please let me know how it turns out for you! Leave a comment and rate the recipe below. This will help me with the creation of future recipes! I’d also love to feature your creation in my monthly newsletter, so you can upload a photo to Instagram or Twitter with the tag @sweetcayenne5 to be featured! Combine the pomegranate juice, ginger, and cinnamon stick in a small saucepan. Bring the juice to a slow boil and reduce to a simmer. Cook, stirring occasionally until the juice is syrupy and reduced to about ⅓ cup. This should take about 15 minutes. Strain the juice into a container and stir in the maple syrup. Chill until ready to use. 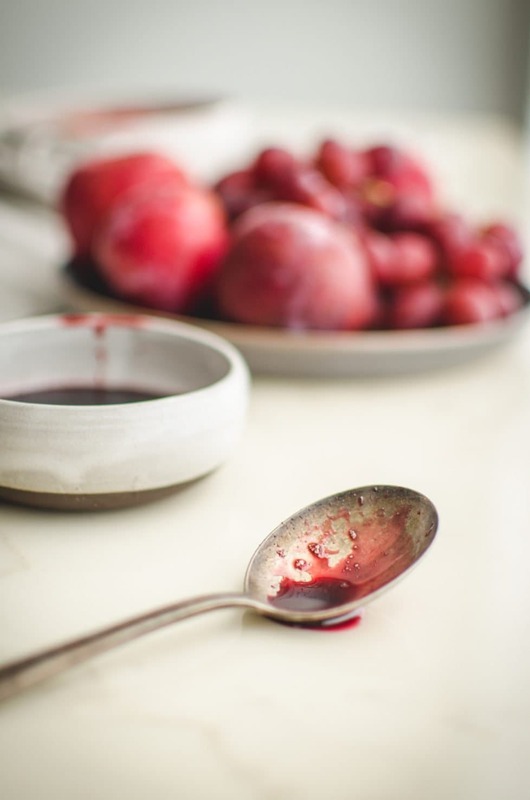 In a liquid measuring cup, combine the cider, club soda, and pomegranate syrup. Stir or whisk to combine. Pour over crushed ice. To make more than one serving: use 2 parts sparkling cider to 1 part club soda with a ½ teaspoon of pomegranate syrup per serving. Love, love, love this! Such a refreshing fall drink. Thank you, Kim! This is what we served at the retreat – I just bought more supplies to make it again for myself this weekend 🙂 Glad you liked it!